Sixth in a multi-part series AT THE MILL. 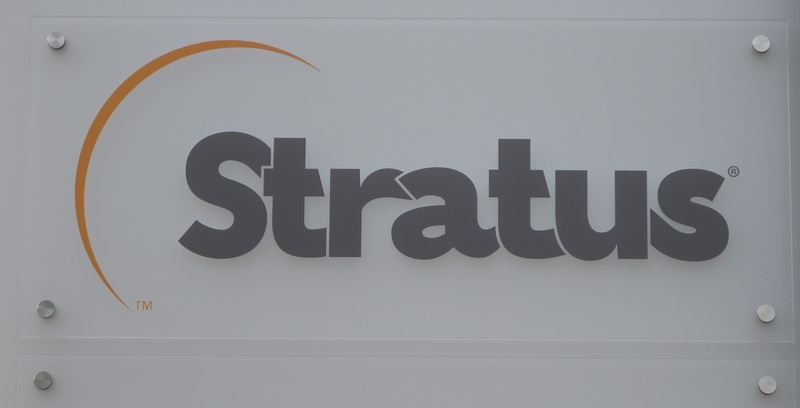 On June 23, 1999, Stratus Computer held a “Welcome to the Neighborhood” event to recognize its recent move into the old Digital/DEC headquarters at 111 Powdermill Road. “Welcome Neighbors” might have been more appropriate, as the invite was so local businesses (restaurants, auto shops, etc.) could introduce themselves to the newest large company to move into space vacated by DEC’s demise. Stratus has had a complicated financial history, what with becoming a publicly held company in 1983, a buy-out, spin-off, acquisitions, de-acquisitions, the name change from Stratus Computer to Stratus Technologies, Inc., and in 2014, acquisition by Siris Capital Group. There were physical moves, too. Founded by William E. Foster in 1980, the corporate was founded in Natick, moved to Marlborough, and then to Maynard. After a long tenure on town’s eastern border, Stratus signed a lease in 2015 to more its headquarters into the mill complex, committing to a tad more than 100,000 square feet in Building 5. In non-business speak, that includes that ATMs have to work 24/7/365 without crashing, because when you want cash at 2:00 a.m., you want it. And when you are in a hospital hooked up to a heart rate monitor, you want that working, too. One term seen in context with Stratus is “edge computing.” Older network concepts were based on information at a data center and instructions sent to the network. Or one step up, information flowed in, processed centrally, instructions flowed out (those ATMs). Now and into the future, networks are becoming more fluid, and a lot more of very reliable computing capacity is needed at the edges of the network. More analytical power at the edges means less of a need to clog the network with data transfer. And keeping those distributed computers robustly fault tolerant means less of a need to put technical staff on the road to fix stuff. Funding never materialized, and the mill lay fallow until a tax break deal was struck for Wellesley Management’s Clock Tower Place. That kept Maynard as a hub for technology-driven companies such as Monster.com. Now, under Mill & Main, here we go again with Stratus Technologies and Acacia Communications (but with a brewery, too).